Fine silver, for example 99.9% pure silver, is relatively soft, so silver is usually alloyed with copper to increase its hardness and strength. Sterling silver is prone to tarnishing, and elements other than copper can be used in alloys to reduce tarnishing, as well as casting porosity and firescale. Such elements include germanium, zinc, platinum, silicon, and boron. Recent examples of alloys using these metals include argentium, sterlium, sterilite and silvadium. In England the composition of sterling silver was subject to official assay at some date before 1158, during the reign of Henry II, but its purity was probably regulated from centuries earlier, in Saxon times. A piece of sterling silver dating from Henry II's reign was used as a standard in the Trial of the Pyx until it was deposited at the Royal Mint in 1843. It bears the royal stamp ENRI. REX ("King Henry") but this was added later, in the reign of Henry III. The first legal definition of sterling silver appeared in 1275, when a statute of Edward I specified that 12 Troy ounces of silver for coinage should contain 11 ounces ​2 1⁄4 pennyweights of silver and ​17 3⁄4 pennyweights of alloy, with 20 pennyweights to the Troy ounce. This is (not precisely) equivalent to a millesimal fineness of 926. In Colonial America, sterling silver was used for currency and general goods as well. Between 1634 and 1776, some 500 silversmiths created items in the “New World” ranging from simple buckles to ornate Rococo coffee pots. Although silversmiths of this era were typically familiar with all precious metals, they primarily worked in sterling silver. The colonies lacked an assay office during this time (the first would be established in 1814), so American silversmiths adhered to the standard set by the London Goldsmiths Company: sterling silver consisted of 91.5–92.5% by weight silver and 8.5–7.5 wt% copper. Stamping each of their pieces with their personal maker's mark, colonial silversmiths relied upon their own status to guarantee the quality and composition of their products. Colonial silversmiths used many of the techniques developed by those in Europe. Casting was frequently the first step in manufacturing silver pieces, as silver workers would melt down sterling silver into easily manageable ingots. Occasionally, they would create small components (e.g. teapot legs) by casting silver into iron or graphite molds, but it was rare for an entire piece to be fabricated via casting. More commonly, a silversmith would forge an ingot into the desired shape, often hammering the thinned silver against specially shaped dies to "mass produce" simple shapes like the oval end of a spoon. The hammering occurred at room temperature, and, like any cold forming process, caused work hardening of the silver, which become increasingly brittle and difficult to shape. To restore the workability, the silversmith would anneal the piece—that is, heat it to a dull red and then quench it in water—to relieve the stresses in the material and return it to a more ductile state. Hammering required more time than all other silver manufacturing processes, and therefore accounted for the majority of labor costs. Silversmiths would then seam parts together to create complex and artistic items, sealing the gaps with a solder of 80 wt% silver and 20 wt% bronze. Finally, they would file and polish their work to remove all seams, finishing off with engraving and stamping the smith's mark. To reduce the amount of counterfeiting of silver items. Use as surgical and medical instruments as early as Ur, Hellenistic-era Egypt and Rome, and their use continued until largely replaced in Western countries in the mid to late 20th century by cheaper, disposable plastic items and sharper, more durable steel ones. Sterling's natural malleability is an obvious physical advantage, but it is also naturally aseptic. Due to sterling silver having a special acoustic character, some brasswind instrument manufacturers use 92.5% sterling silver as the material for making their instruments, including the flute and saxophone. For example, some leading saxophone manufacturers such as Selmer and Yanagisawa have crafted some of their saxophones from sterling silver, which they believe make the instruments more resonant and colorful in timbre. ^ From ancient Greek στερεός [stereos] = 'solid'. 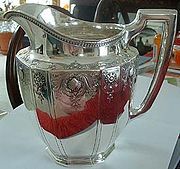 ^ "The Care of Silver"; Web article by Jeffrey Herman, silversmith, specialist in silver restoration and conservation. Retrieved 28 Nov 2017. ^ "Understanding how silver objects tarnish". Government of Canada. n.d. Retrieved 2018-05-05. ^ The Journal of the Manchester Geographical Society, Volumes 19–20. Retrieved 2016-09-16. ^ Family, Commerce, and Religion in London and Cologne. Retrieved 2016-09-16. ^ "sterling, n.1 and adj.". OED Online. December 2011. Oxford University Press. Entry 189985 (accessed February 28, 2012). ^ Commentaries on the Laws of England. Retrieved 2016-09-19. The most plausible opinion seems to be that adopted by those to etymologists, that the name was derived from the Esterlingi, or Easterlings, as those Saxons were anciently called who inhabited that district of Germany now occupied by the Hanse Towns and their appendages, the earliest traders in modern Europe. ^ Chamber's Journal of Popular Literature, Science and Arts, Volume 4. December 10, 1887. p. 786. In the time of King Richard I., monie coined in the east parts of Germanie began to be of especial request in England for puritie thereof, and was called Easterling monie, as all the inhabitants of those parts were called Easterlings; and shortly after, some of the countrie skillfull in mint matters and alloys were sent into this realme to bring the coin to perfection; which since that time was called of them Sterling, for Easterling. ^ Zupko, Ronald Edward (1985). A Dictionary of Weights and Measures for the British Isles. Independence Square Philadelphia: American Philosophical Society. ISBN 978-0-87169-168-2. In England the term "sterling," originally "easterling," and in france the synonymous term "esterlin," were used to denote the twentieth part of the ounce, also called "penny" in England, and "denier," from denarius, in France. ^ "The Trail of the Easterlings" (PDF). 1949. Retrieved 2016-09-18. ^ Accounts and Papers of the House of Commons: 1866. Second. House of Commons. 23 March 1866. pp. 14–15. OCLC 11900114. ^ a b Tunis, Edwin (1999). Colonial Craftsmen: And the Beginnings of American Industry. p. 81. ^ a b c Martello, Robert (2010). Midnight Ride, Industrial Dawn: Paul Revere and the Growth of American Enterprise. p. 42. ^ Tunis, Edwin (1999). Colonial Craftsmen: And the Beginnings of American Industry. p. 83. ^ Martello, Robert (2010). Midnight Ride, Industrial Dawn: Paul Revere and the Growth of American Enterprise. pp. 42–43. ^ Martello, Robert (2010). Midnight Ride, Industrial Dawn: Paul Revere and the Growth of American Enterprise. p. 107. ^ Martello, Robert (2010). Midnight Ride, Industrial Dawn: Paul Revere and the Growth of American Enterprise. p. 109. ^ Kauffman, Henry J. (1995). The Colonial Silversmith: His Techniques & His Products. p. 126. ^ Falino, Jeannine; Ward, Gerald W. R., eds. (2001). New England Silver & Silversmithing 1620–1815. p. 156. ^ Watt, Susan (2003). "How silver reacts". Silver. The elements. Tarrytown, NY: Marshall Cavendish. p. 13. ISBN 0-7614-1464-9.